Greg Anderson is the owner/operator of Wakesurf Vermont (along with Enzo, our French Bulldog). He will teach you the basics from getting up behind the boat to ‘cutting the cord’ and dropping the rope to surf the endless wave! Advanced lessons are also available to help improve your techniques. He is a certified USCG Captain and has operated boats in Vermont for over 10 years on Lake Champlain. He is also a certified instructor through the USA Water Ski Association along with CPR and First Aid certified through American Red Cross. Greg grew up waterskiing, kneeboarding and skurfing on the Delta River in the Sacramento Area, California behind his dad’s tri-hull 17′ Glastron ski boat. Wakeboarding since the age of 16, he and two friends pooled their money together after graduating from college and purchased a 1988 Bayliner, complete with a 10′ pole to maximize their wakeboard airs! 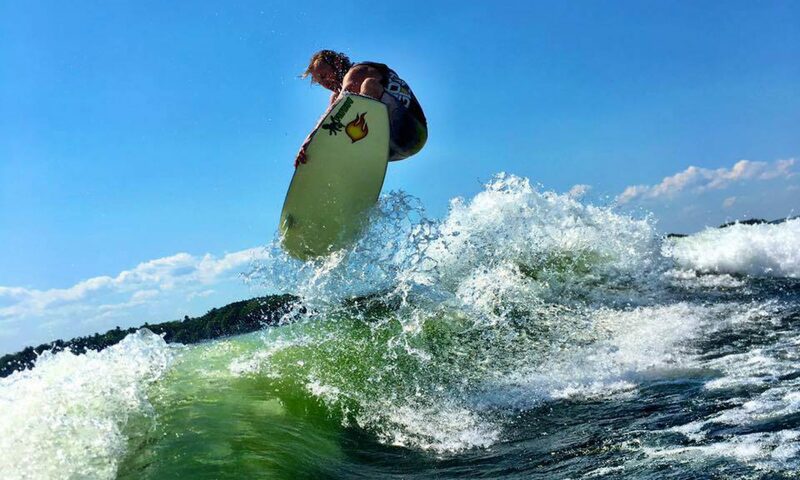 After relocating to New England for a his career, he began wakesurfing on Malletts Bay on a coworker’s Mastercraft before purchasing his first wakesurf boat in 2008. He has since instructed dozens of friends and individuals on basic-to-advanced wakesurfing skills and introduced them to the sport. He’s served as a consultant and influenced many others on boat purchases and related products. 2018 is our first official year of offering wakesuring lessons to the public and we’re looking forward to making your day on the lake fun and hassle-free. Aerial videos and photos can be added for an additional fee. Give us a call or head over to our reservations and come surf the endless wave!